Hitting it on the Head! The most efficient and effective way to get something done. 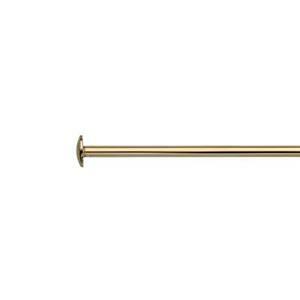 The GFHP22 – Yellow 14/20 Gold Filled 2 inch 22 gauge headpin findings. 4# hard with a 1.8mm head. Headpins are to jewelry artisans what needles are to fashion couturiers. In simple language – you’d be lost without them. 22 gauge gold filled wire material is a little thicker than 24 gauge but thin enough to make wire wrapping easy and it will hold its shape. When you put all your heads together you wind up with one great jewelry piece!